You can’t help but wonder if cheap means poor quality, especially when it comes to food. We know that fresh food from Aldi is a cheaper. But surely the cheaper pantry brands won’t be as good for you as the leading brands? Aren’t home brand foods full of fillers, additives and other nasties? I’ve compared a trolley full of packaged food from Aldi with the leading brands. And you might be in for a surprise. There isn’t always a clear winner when you compare two products. Typically, you want to choose the one with the lowest sodium, saturated fat, trans fat and added sugars. You also want to choose foods that are high in fibre and any added nutrients are a bonus. Price is also going to be a factor. Are you getting good value (nutritional quality) for your money? 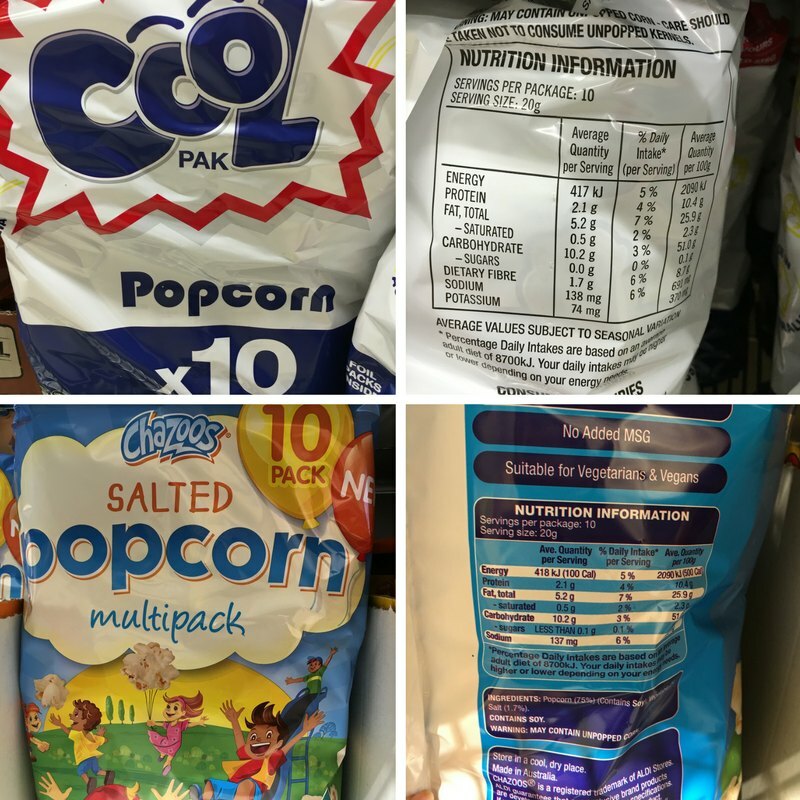 Here’s 10 common packet foods that I compared. You’ve probably got some of these in your pantry. First, I compared the prices of the leading brand and the closest Aldi brand (no surprises here). Then, the ingredients list. My marker of quality was the main ingredient. Was it as high as in the main brand? Was there something else added to fill it out? 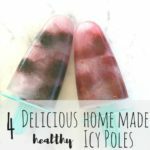 I was also interested to see if there were any extra nasties added like more added sugar or salt. 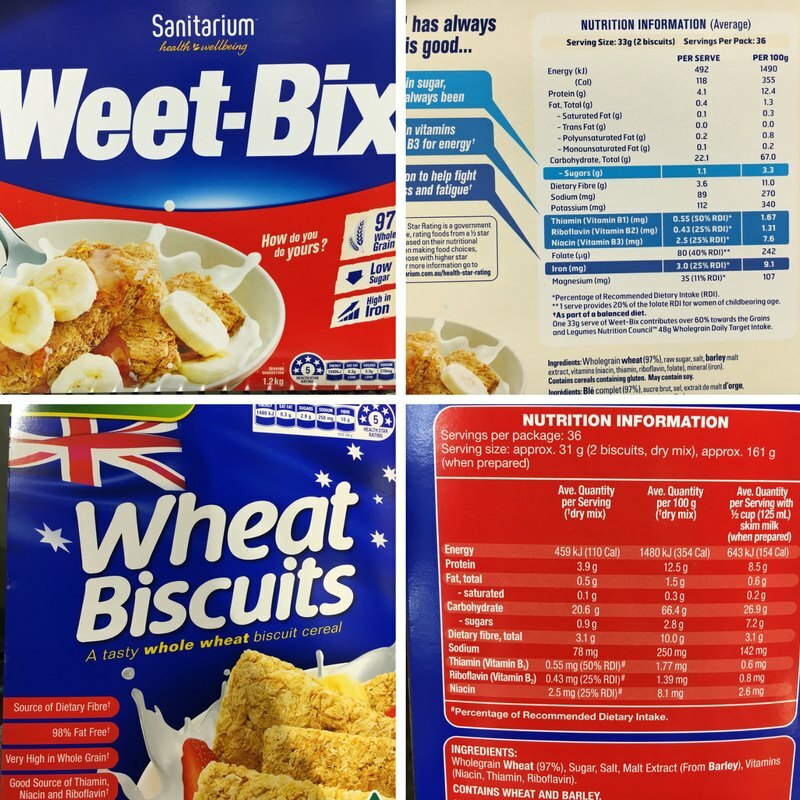 Finally, I looked at the nutrition information panel to see which were the best choices in terms of fats, sugar, sodium and fibre. 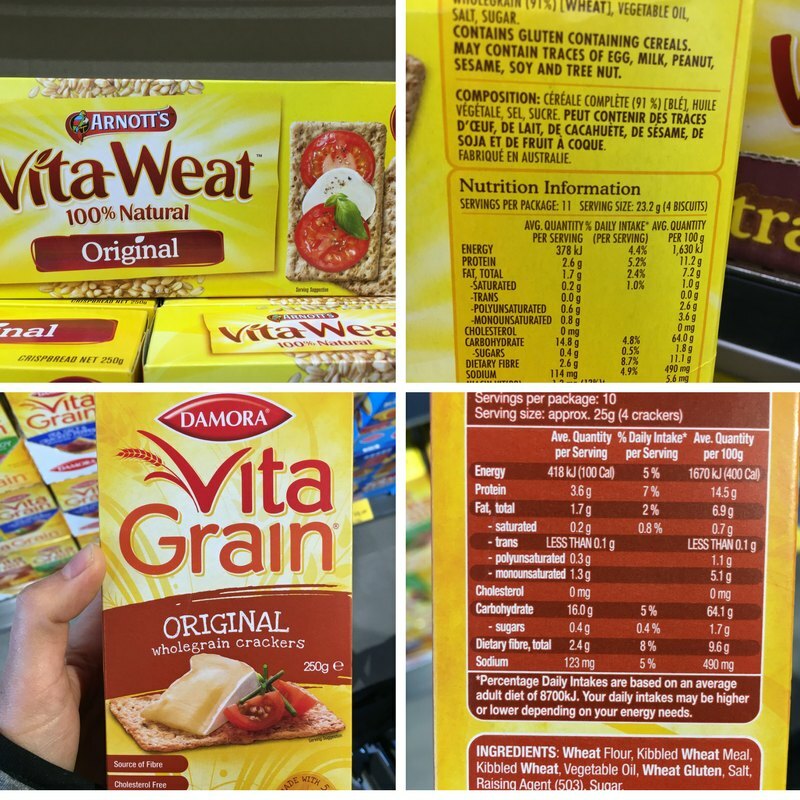 Price: $3.85 for a box of Vita Weats is $1.54 per 100g. Aldi’s are $1.99 or $0.80 per 100g. Nutrition: These two are very similar products made from wheat flour, oil, salt and sugar. Both are healthy choices. Price: $4.50 for a 1.2kg box of Weet-Bix is $0.38 per 100g. Aldi’s are $3.19 for 1.12kg or $0.29 per 100g. Nutrition: Both are 97% wheat, contain added B Vitamins and are high in fibre. GoldenVale wheat biscuits don’t have added folate or iron but have slightly less sodium. If you don’t eat meat or are trying to increase your iron intake – go for Sanitarium’s Weet-Bix for the extra iron. 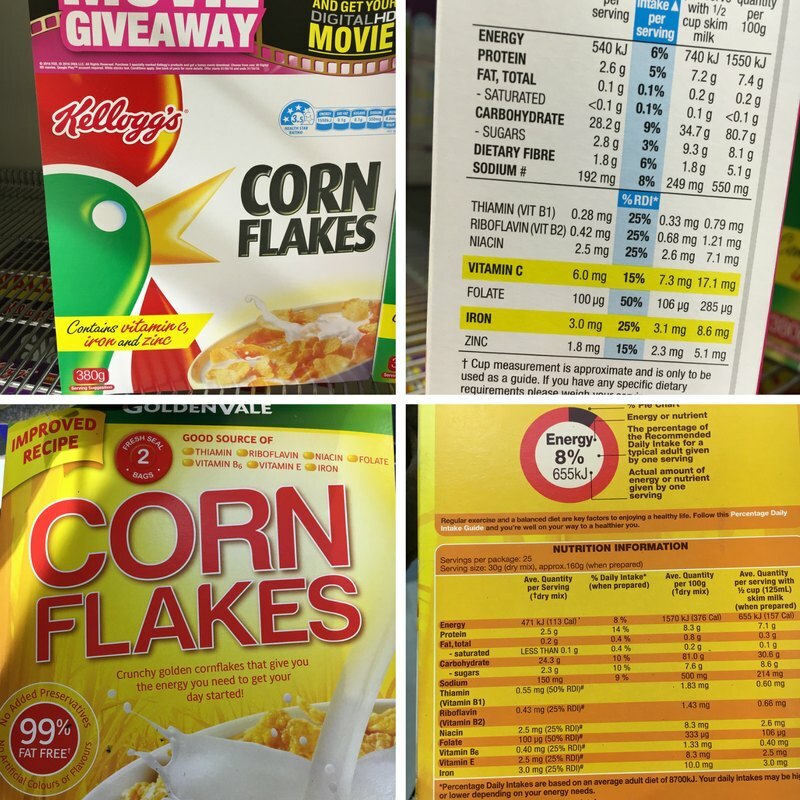 Nutrition: Kellogg’s Cornflakes have more iron added, but twice the sodium. They are both low in fibre for a breakfast cereal. Neither are a great choice as they are highly processed and low in fibre. Price: $6.27 for a 500g box of Carman’s is $1.25 per 100g. GoldenVale is $2.99 for 750g or $0.40 per 100g. 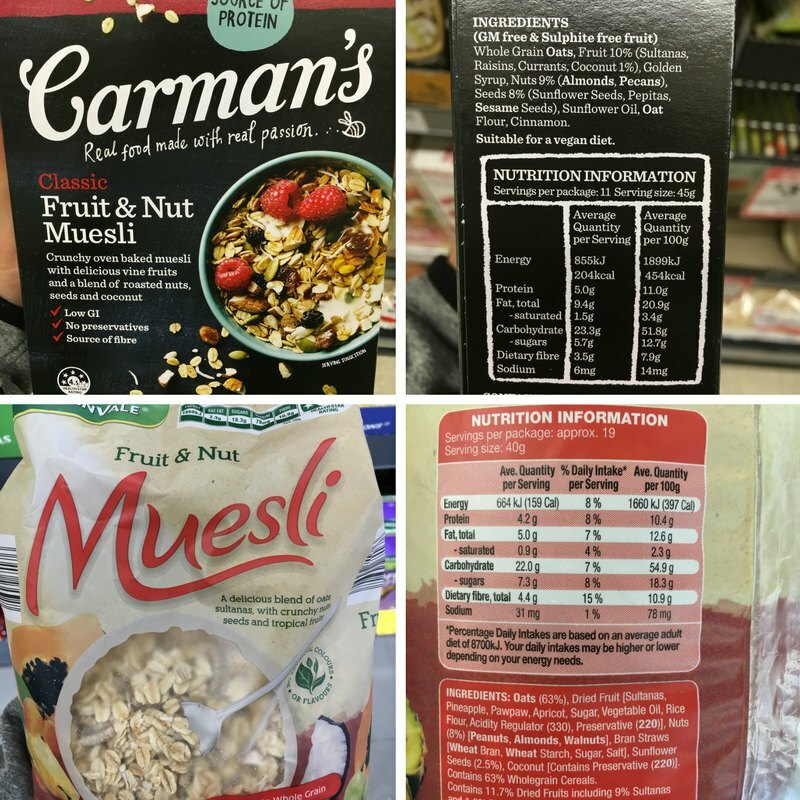 Nutrition: Carman’s muesli is 10% fruit and 9% nuts. GoldenVale is 11.7% fruit and 8% nuts. Both are high in fibre and low in sodium which is typical of any muesli. GoldenVale is higher in sugar and although most is from the fruit, there is some added sugar in there too. The biggest problem with the GoldenVale muesli is the fruit, which contain too many additives. The preservative (220) could be an issue for asthmatics. Carman’s has added sugar (golden syrup) and oil to make it crunchy. This has added to the fat content bumping up the kilojoules. You could do better than both of these by chosing an untoasted muesli that has real dried fruit and doesn’t have added sugar or oil. Or make your own by mixing rolled oats, chopped unsalted nuts and chopped dried fruit. 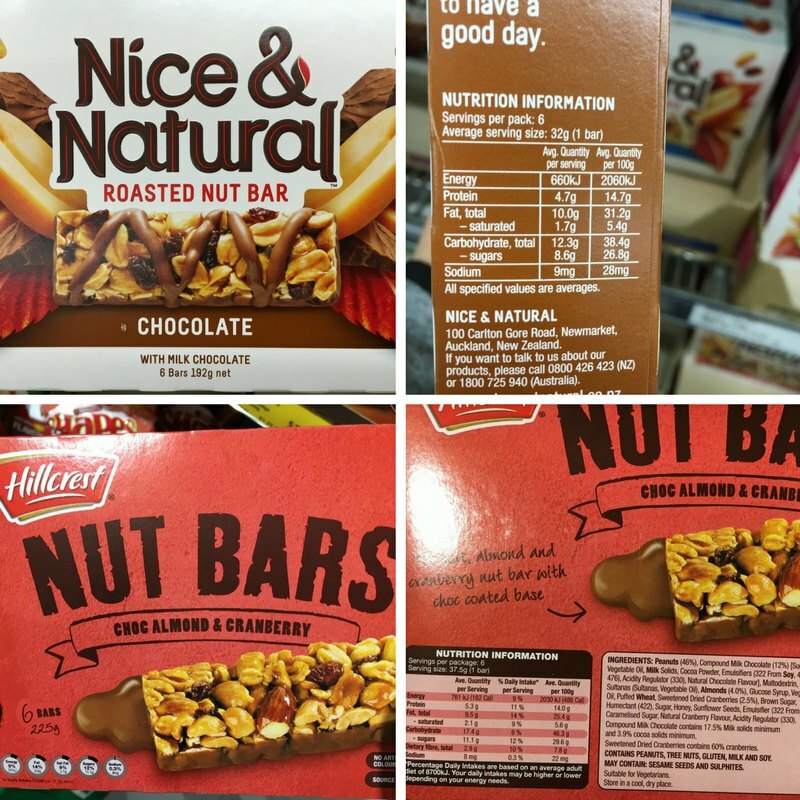 Price: $4.40 for a 192g box of Nice & Natural nut bars is $2.29 per 100g. Hillcrest nut bars are $2.59 for 225g or $1.15 per 100g. Nutrition: Nice & Natural’s nut bars are 59% peanuts. Hillcrest are 47% peanuts and 4% almonds (51% nuts). Both are low in sodium and high in protein as you would expect. Nice & Natural are higher in fat, but with more peanuts this is to be expected. Hillcrest bars have more processed ingredients with added sugars and oils and additives. You’re better off with a small handful of natural or dry roasted nuts and dried fruit. If that’s not going to happen and you need the convenience of a bar, there are better ones out there. Nut bars and muesli bars are glued together with sugars. Choose one without a chocolate or yoghurt coating. Look for small serve bars with less than 15g of sugar per 100g. Price: $4.17 for a 200g packet of Coolpak’s is $2.08 per 100g. Aldi’s is $2.69 or $1.35 per 100g. Nutrition: These two are identical for ingredients, fat and sodium. Popcorn is a great alternative to potato chips and salty rice crackers, but both of these are quite high in salt, especially for kids. I wouldn’t be putting these in lunchbox every day. You can make your own popcorn really quickly (with no washing up). Put a tablespoon of popping corn into a paper bag and fold over the edge a few times. Then microwave on high for a minute or two, or until the rapid popping starts to slow down. Price: $2.31 for a 420g can of Heinz is $0.55 per 100g. Aldi’s is $0.79 or $0.19 per 100g. 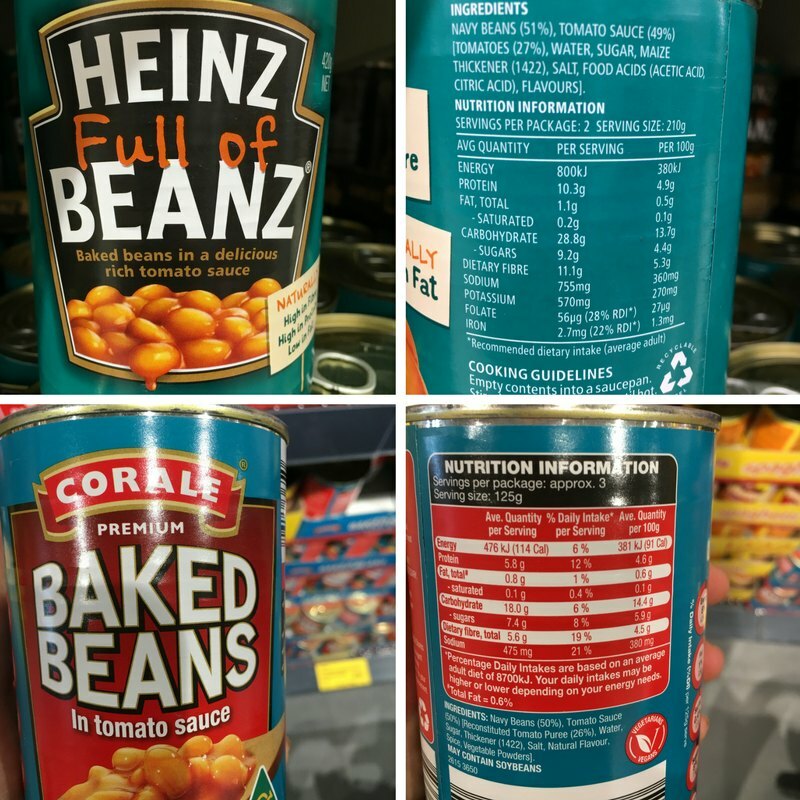 Nutrition: Heniz 51% Corale 50% Baked Beans. Both are very similar. Corale has slight more sugar and less fibre but it does have slightly more sauce and less beans. Not enough to make a real difference. Price: $5.05 for a 375g jar of Kraft Peanut Butter is $1.35 per 100g. Aldi’s is $2.39 or $0.48 per 100g. 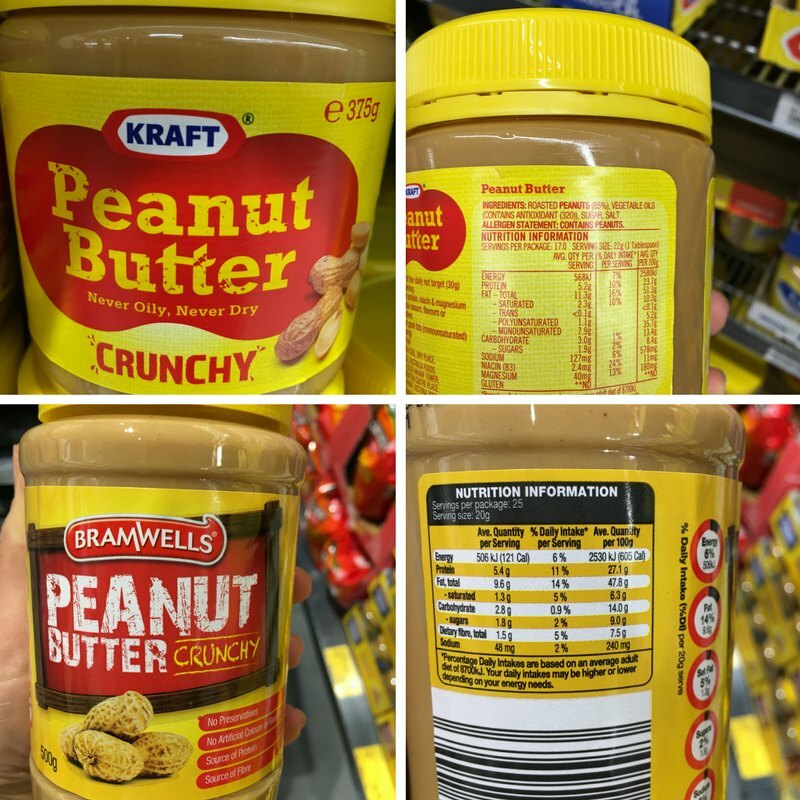 Nutrition: Kraft has 85% peanuts, Bramwells is higher with 90% peanuts. Both have added oil, sugar and salt. Bramwells has less than half the sodium for less than half the price. You could actually do a lot better than both of these. Look for a peanut better with no added sugar and salt. You wont find one at Aldi, but there are plenty of brands that are doing ‘natural’ versions that are just peanuts – no added oil, sugar or salt. If you’re used to regular peanut butter it will take a week to get used to. But once you are, you’ll wonder how you ever ate sweet peanut butter. Price: $3.30 for a 500g jar of Leggo’s is $0.66 per 100g. Aldi’s is $1.35 or $0.27 per 100g. 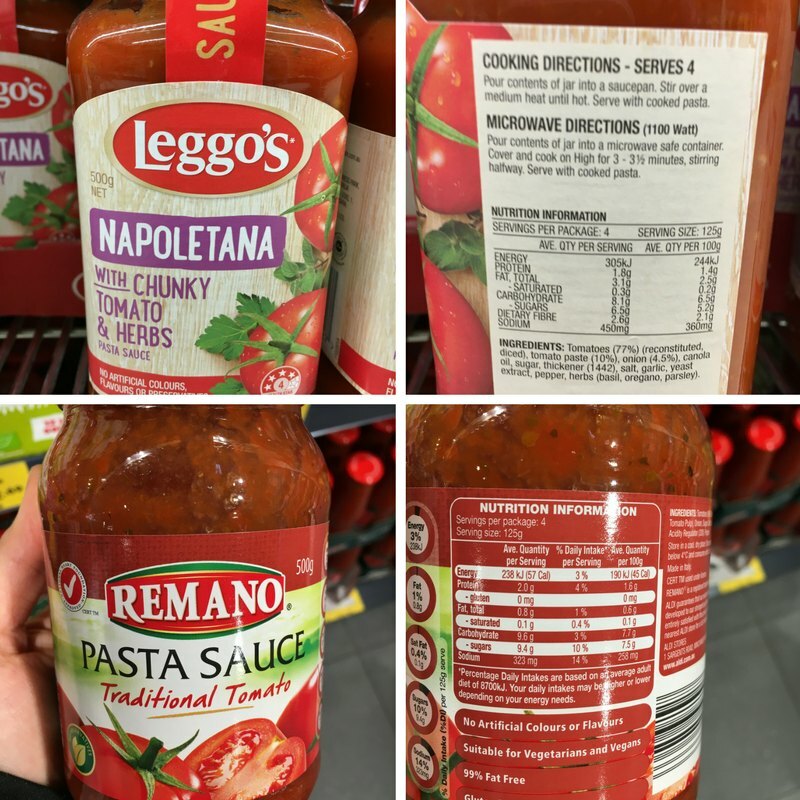 Nutrition: Leggo’s is 77% tomatoes but also 10% tomato paste, Aldi’s Remano is 86% tomatoes. Leggo’s has more sodium but slightly less sugar. 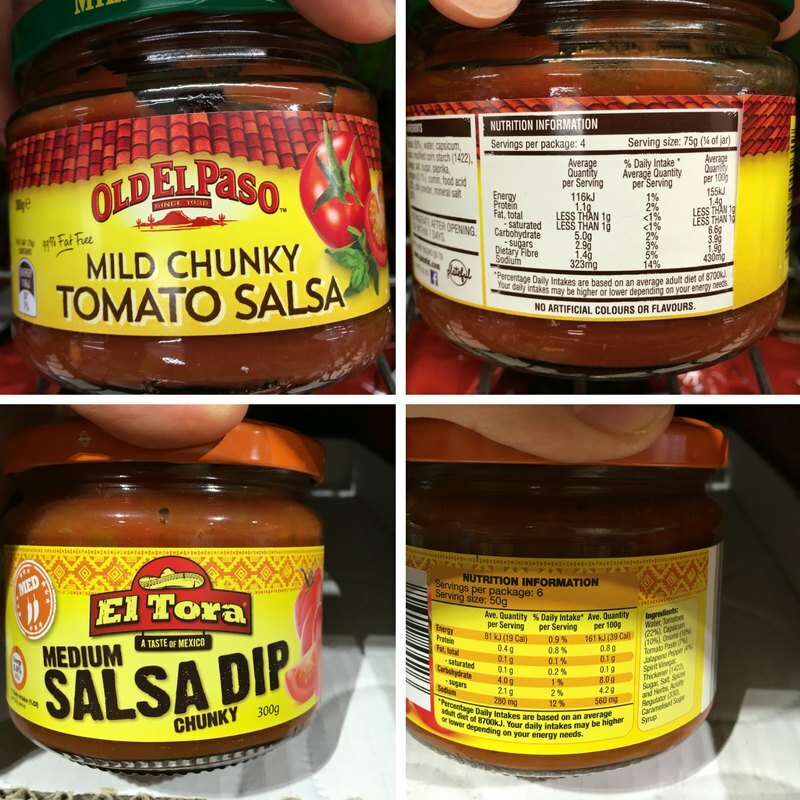 Price: $2.80 for a 300g jar of Old El Paso salsa is $0.94 per 100g. El Tora is $1.35 or $0.45 per 100g. Main Ingredient: Old El Paso is 50% tomatoes but El Tora is only 22% tomatoes. El Tora is also higher in sodium. The Verdict. 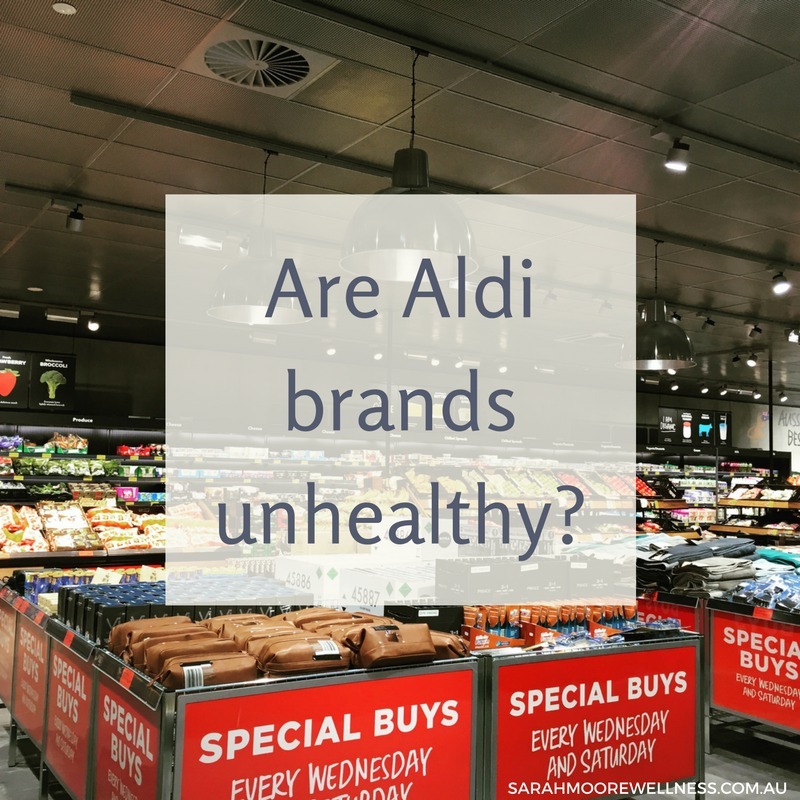 Are Aldi brands unhealthy? In this comparison our Aldi’s own brands gave us better value for money. If they weren’t healthier they were comparable but cheaper. So price isn’t a good indicator of quality or how healthy a food is. Supermarket brands can be just as healthy if not healthier than the leading brands. Always read the labels. Choose foods with the least added sugars, sodium, saturated and trans fats. Look for foods high in fibre. Food with a short ingredients list with few words you don’t know, is likely to be a winner. If you’re overwhelmed reading food labels in the supermarket or if you just don’t know what you should be looking for. Get in touch. I can help you decode the labels in your own pantry and together we can make a plan to restock with healthy food the family will love. Thank you so much for doing this comparison. We live in country Victoria and really only have access to Woolies and a very tiny IGA. it’s about a 30-40 min drive to Aldi but we’re thinking of making the switch. This might just be the tipping point. Being time poor with two toddlers this is a big time saver. Hi Kristen, I have found Aldi to be really good for a bulk shop and as a result I’m shopping less. I still need the regular supermarket for a few things (like natural peanut butter). Always read your labels and you might find a few surprises! Well done. As an unemotional, numbers person, I like your approach to the issue – facts, not feelings. 99+% of people don’t read labels. Most can’t understand them. Australians are white bread eaters. Even though the knowledge of healthy eating is freely available, few avail themselves of it. Such is life. It’s impossible to educate the great unwashed. Hi Kristen. Been dumpster diving at ALDIs for over 20 years and love it ! Aldi do have a 100% peanut butter, brand name: Oh So Natural Wholefoods. It’s supposed to be crunchy but it’s not very crunchy. 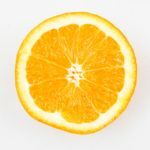 You’re right, there have been a few new products added since this post was published – time for an update!